OLIVER CROMWELL, halfcrown, 1658 (S.3227A). 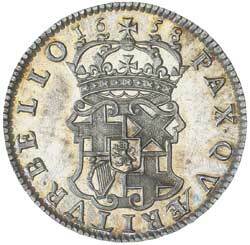 Light grey iridescent toning, proof-like virtually mint state, choice uncirculated and rare, one of the finest known. Ex J.P.Melick Collection, private purchase from Spink Australia, 17th July, 1980 ($5,000). 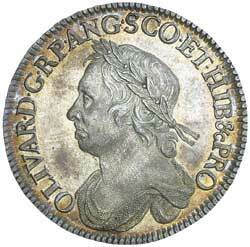 OLIVER CROMWELL, halfcrown, 1658 (S.3227A). Attractively toned, extremely fine and rare.